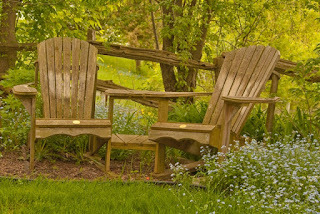 Ground Motive: The Question of "God"
A secluded place in the garden was my favourite place to meditate on God’s presence. That did not always result in knowing God is near. At other times I struggled with the questions that won’t go away for many, especially younger, people in our times. This piece was written about 10 years ago during the days our daughter was dying. Her impending death often made God feel distant, but also spoke forcefully about God as love. Mystical experience traverses all religions and is not limited to religious people. This raises a big question: when we speak of God in the context of mystery, what are we saying, what do we mean? The word "God" has such wide and indefinite usage that, one might say, it has lost its meaning. Is God Jahweh? Allah? Father of Jesus? Creator? An individual, immaterial, invisible spiritual being who is omnipotent and omniscient? Do atheists reject the same as what Christians confess? All of these? None of these? When I speak of God in conversation, how will my conversation partner hear me? Our response to these questions is largely shaped by the tradition in which we normally use the word “God.” But in an age of universal ecumenism, many of the faithful in a tradition may affirm both that for them God is the God they have learned to know in their tradition and that God is not confined to that tradition. The one God of monotheism is a late arrival, preceded by a world populated by good and evil spirits with divine powers. These spirits may have been invisible and immaterial, they may also have been embodied and been visible from time to time. Maybe there was a chief spirit, the great spirit, but not to the exclusion of river spirits, harvest spirits, sky gods, earth demons, etc., etc. It is likely that all of this can be seen as personifications of how the spiritual forces unleashed by the mystery were manifest to human beings in a truly enchanted world. If we continue to be open to the presence of the mystery in all that surrounds us we should be able to connect with this earlier phase of our history. And we should also be able to relate to monotheism as born of the realization that in the most profound mystical experiences all is one. At the same time monotheism tends to lead us away from the earlier enchanted world. The mystical reality of God, however, may suggest monotheistic religion would benefit from re-inventing an enchanted world, that is, a world in which everything speaks of the mystery and in which, given the right conditions, we all can (to some degree) experience our oneness with all things and the bliss, peace, and love of that oneness. In the Christian tradition God as the All in all is a deeply Biblical perception. So when, in listening to Arvo Part's Te Deum, we feel transported outside ourselves in becoming one with the music, that could be called a "God" experience, a bit of revelation of the mystery. And I would say the same of the bliss I experience in the garden when all is silent and I feel myself as less separate and more one with the other creatures. Historically our connection with God has come to us, in community with others, in the context of a given spiritual tradition and its richness. The great religions, each in their own way, help us give meaningful shape to living with the mystery. All global traditions, however, despite their own specific character, emphasize the spiritual priorities of oneness, peace, love, joy. By being immersed in the Christian tradition, the ecumenically shared experience of the One takes on more specific and concrete meaning when interpreted "in Christ." For in the following of Jesus one reaps the spiritual benefits of special emphases on servanthood, on sacrificial love, on being content by not seeking to be the first, on becoming oneself not in seeking but rather in losing oneself. And the meaning of these as Christian spiritualities can in turn only be experienced via the roots of Jesus' life in the history of his Jewish tradition. Nevertheless, an interpretation of life with God “in Christ” does not sever the connection with the fundamental orientation of other traditions.